1. Today is International Talk Like a Pirate Day, which makes me happier than you’d think, and I have no idea why. According to the Pirate Name Generator, my pirate name is Cap’n Shakira Dullblade. For staff meeting today, I made little signs for all the staff with their pirate names (shoutin’ out to Fruity Lindsey Hornigold!). My husband, Ambiguous Edward Dregg, was not nearly as amused as I was. Somehow, that made it even more hilarious. But the best part of Talk Like a Pirate Day was that as I walked across the U-M campus, I actually saw a student dressed from head-to-toe like a pirate. Except for his backpack. I love Ann Arbor. ARRRRGH! 2. Every day I ask the boys what they want to be for Halloween, though they have no idea what Halloween is. Every day Tiny Dancer tells me, “a pig and a lion.” I love this, because it is an unexpected answer and an incongruous pairing. He wants to be the pig and he wants Little Buddha to be the lion (which is what LB was last year). Today, Little Buddha said, “a pig and a giraffe.” No way am I trying to put together a giraffe costume. So I’ve been trying to convince them to go for a pig and a cow, which would be a believable pairing, and not too hard for mommy to make. But neither wants to be the cow, or the giraffe, or the lion. They both want to be the pig. So I think we’re going to have two pigs for Halloween. I think I’ll get pink sweatsuits, try to sew little corkscrew tails on, and buy snouts. So all I have to figure out is the headpiece. I could just do a headband and make some ears to attach to it. Or I could try to sew a hood with ears on it. My latest thought is to knit the Kittyville hat from SnB but to knit it in pink so it would look like pig ears. Thoughts? Suggestions? 3. My new babysitter won’t be here tomorrow because she’s going to be on Oprah! It’s a segment on motherhood, and she wrote a letter to the show and they liked it well enough to invite her. How cool is that? 5. I got my hair chopped off today. Well, chopped for me (about five inches). I found your blog when I googled “cozy shawl” 🙂 I started my own a week or so ago. All’s well so far; I’m about halfway done with it. I love your haircut. Mine’s about the same length, and almost as curly. I’m wanting to know what hair products you use! 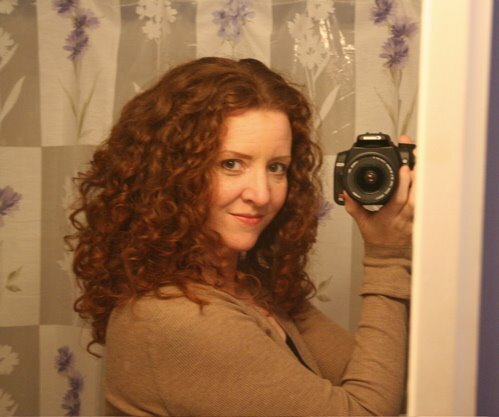 How do you get your great curls with no frizz?? Your hair looks so cute! Can’t wait to see it in person. Two little pigs is adorable! That’s the best pairing of all, in my opinion. The Kittyville hats would be super cute, but if you don’t want to invest that kind of time, I think headbands would be fine. Your hair, as usual, looks fantastic! My gosh, you have great hair! It took me 6 years in Cleveland to find someone I could trust to cut my hair. Your hair looks fab!I am growing mine out! I just got it trimmed a way that it will grow out nicely. The first time I am attempting to go shoulder length or beyond in 11 years! Your hair looks wonderful! I can’t wait to have shorter hair again. I think your boys would be adorable as 2 little pigs! 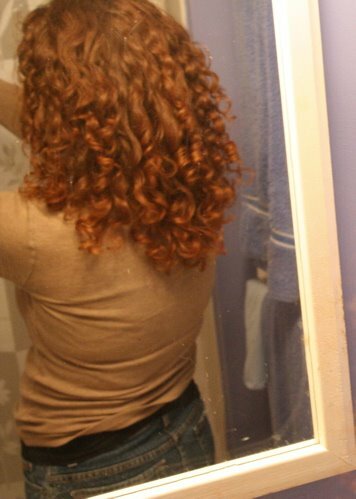 Great curls! I’m currently growing my hair–it’s very short. While mine is curly like yours, the all-over curl pattern is inconsistent. I envy your curls. Great cut! I’m totally cracking up at you spreadin’ the pirate love at work! That sounds like fun and I bet the staff loved it — even if Mr. Dregg didn’t fully appreciate the humor! Want to know what day I’m excited about? National Punctuation Day, Sunday September 24. No, really, I’m serious. I’m very excited about this.